It is such a pleasure for me to join you at this first U.S.-Islamic World Forum held in America. His Highness the Amir and the people of Qatar have generously hosted the Forum for years. . . . I was honored to be a guest in Doha last year. And now I am delighted to welcome you to Washington. I want to thank Martin Indyk, Ken Pollack and the Saban Center at the Brookings Institution for keeping this event going and growing. 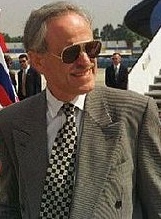 Indyk (pictured above) and Pollack have helped to shape US foreign policy in the Middle East for decades. They are currently housed at the Saban Center, thanks to the generosity of Haim Saban, an Israeli-American media-mogul and one of the biggest contributors to the campaigns of pro-Israel politicians in the U.S.
Saban has been described by a New York Times reporter as a “tireless cheerleader for Israel.” He has also founded various centers and institutions to produce policy research favorable to Israel. In 2002 he pledged $13 million to found the Saban Center for Middle East Policy at the Brookings Institution, which is now directed by Indyk, who had earlier founded the Washington Institute for Near East Policy, an AIPAC spinoff. This is the organization which hosted the US-Islamic Forum last week, the event at which Indyk’s good friend Hillary Clinton, was the keynote speaker. Since [Saban] lost the hold he had in the White House through his good friends Bill and Hillary Clinton, the Saban Center at the Brookings Institution and the Saban Forum have become his levers of influence on political Washington and on Jerusalem. Shavit writes further that “one of the achievements of which [Saban] is proud” is his ability to bring together Ariel Sharon and Bill Clinton, Shimon Peres and Henry Kissinger, Tzipi Livni and Condoleezza Rice. At that economics and security leaders’ press conference, Israel’s former Shin Bet Director General Yaakov Perry, described the current status quo in the West Bank as “presenting a mortal threat to the state of Israel”. Our continued presence in the [Palestinian] territories is a threat to Zionism. With every passing minute further damage is done to the state of Israel.” One thing is clear, the Middle East is changing, dramatic things are happening around us, we are witnessing historic changes towards reform, most of which are not being led by extremist groups. It does not portend well for Israel’s enonomic future when the US Congress gives Israel’s Prime Minister Bibi Netanyahu a prestigious forum in Washington to present his “plans for peace” to the world. That is most certainly not the “change toward reform” that Israel’s economic and security leaders were talking about. The event to which Bibi has been invited is in addition to his usual appearance at the AIPAC Washington Policy Forum that hears from Israeli leaders every year. 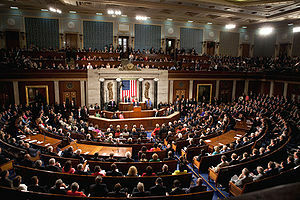 The prestigious forum before which Bibi will speak in late May is a joint session of the US Congress, a platform given to him by the new Big Dog in Washingon, House Speaker John Boehner, of Ohio. The Speaker took time away from budget trashing to invite Netanyahu to speak to a joint session of Congress during the Prime Minister’s May 22-24 visit to Washington where his address there will be a highlight at the AIPAC Policy Conference. Netanyahu’s appearance will be a dramatic change from joint session appearances by previous Israeli prime ministers. On two previous occasions, when an Israeli prime minister appeared before a joint session he was not alone. He spoke in tandem with the leader of a neighboring Arab state in connection with completed peace negotiations. On September 18, 1978, Egyptian President Anwar Sadat and Israeli Prime Minister Menachem Begin, spoke to a joint session. Then, on July 26, 1994, King Hussein of Jordan and Israeli Prime Minister Yitzhak Rabin, addressed another joint session. These occasions were related to peace efforts organized by first, President Jimmy Carter and then by President Bill Clinton. Aaron David Miller, a long-time State Department pro-Israel operative, was around during those earlier PM appearances. He is now comfortably esconced at the Woodrow Wilson International Center for Scholars, where, among other duties, he writes pro-Israel articles for pro-Israel newspapers like the Washington Post. In almost two decades of working on Arab-Israeli negotiations as a State Department adviser and negotiator, I’ve come up with more than my fair share of dumb ideas. But the notion Palestinians are cooking up, for U.N. action on Palestinian statehood this fall, takes dumb to a new level. And there you have the establshment Zionist line. Negotiations are the only answer. Anything else is just plain “dumb”. Tom Friedman could not have said it better. The Palestinians have heard this before from American pro-Israeli politicians and pundits. Talk to the Israelis. We are here to help you. Trust us. If you will talk friendly-like, those settlements that are spreading over your land will be negotiated. Those endless checkpoints will not always be there. When Israel launches military assaults to hunt down “militants”, they do not mean to kill civilians. Trust us; we are Americans who believe in justice. Such nonsense no longer rings true in Ramallah, Hebron, Jenin, nor Jerusalem. Palestinians know full well that the Israel Lobby maintains its tight grip on the US Congress, the media, and the White House. They also know that Hillary Clinton, Aaron David Miller, Martin Indyk, and rich moguls like Haim Saban, have been around for a long time. They are not going away. For Miller, in his Washington Post column, it is “dumb” to move away from negotiation when the prison keys are locked inside the warden’s safe? What would Miller have the Palestinians negotiate for? Extra desserts, ice cream once a week? The Washington Post is on Miller’s side. These comments in a recent Post editorial sing the same song with the same words. European governments have been pressing for a new initiative by the Middle East “Quartet” — a group made up of the European Union, the United States, the United Nations and Russia — that would attempt to set the parameters for Palestinian statehood. . . .
Only the parties themselves, Madam Secretary? The parties are the warden and the prisoner. Someone besides the warden will have to take away those keys and open those prison doors. At the moment, the Palestinian Authority is counting on world opinion to jar the United Nations into action on behalf of those who demand freedom. So let Prime Minister Netanyahu give his speech to the joint session, and let the Congress cheer his every word. Outside those hallowed halls there are growing demands for justice which are being heard in the UN, and eventually may even be heard inside the walls of our morality-keeping, “can’t we just all get along” churches. This entry was posted in Media, Middle East Politics, Politics and Elections. Bookmark the permalink. How appropriate for the One who owns Congress to give the almighty Word, right from the Source. The new spin that will ensure the continuance of the Occupation, the maintainence of the status quo (which is becoming less and less sustainable), to which all Americans must and will pledge allegiance! Ugh! Spare me! God, in your mercy, bring justice! Great piece Jim. Of course the news is the usual misery, as suggested by John above. The power that the Israeli Lobby has over our nation and Congress regarding our mideast policy is truly daunting, and I feel that the voices of justice have no role in our policies, and I feel that I have no say in my government since I don’t have lots of money to give the politicians to vote my way. My only hope is that forces of justice will eventually prevail against the lies and deceptions of those in power. We can never give up, but keep the struggle for justice alive, even when it feels hopeless. I echo John Kleinheksel’s “God, in your mercy, bring justice!” And in the meantime, let the protests begin. Thanks again for the detail of your analysis, Jim, naming the names and recalling the real history. I feel as Fred does, and wish that, as Judy puts it, the protests might begin. But the problem is one of organizing. The pro-justice Jews in this country are organizing (though I’m not really sure where to put J Street on the justice spectrum). But Christians for the most part have done too little organizing. Thank God for Friends of Sabeel, but it is as yet only a very small voice. Anyone know of other organized or organizing Christian groups? And note that I omit Churches for Middle East Peace since I’ve found them so “mainstream/State Dept” in orientation that I’m afraid they may do more harm than good — little hope for protests from them. Yes John, except for voices like Jim’s, very little comes from Christian voices against the outrages of Israeli apatheid, land confiscations, house demolitions etc. Recently, Jewish American Rabbis sent a letter to Congress insisting that US military aid to Israel continue full steam ahead. They are openly advocating for injustice and supporting an apartheid state. Where is the Christian letter to Congress demanding that this aid be ended until Israel ends the occupation and apartheid? Will it ever be written and sent? The Israeli governmemt is weirdly becoming the Jews’ own worst enemy. Those of us old enough to remember the German concentration camps are very happy the Jews have a country of their own, but the way the current Israeli goverment is behaving – disriminating against non-Jewish inhabitants and greedily taking over more and more land from a very weak neighbor, is giving them a worse portrayal than even Shakespeare did, in the Merchant of Venice. Quite right, it is the apathy of all the others in the U.S.–Christians, Buddhists, secularists, or whatever, that do not bring any pressure to bear on our government, and they represent the majority. I do my best writing letters, which is of course meaningless, but there has to be a huge, tsunami of people to push the Palestinian cause. For one reason, it gets no publicity or mention in the mainstream media. PBS has done no thorough documentary on Palestinian suffering. Somehow the gigantic wave must start moving towards the congress. People must demand debate and discussion, and those who criticise Israel must not fear to speak up. All the facts must be made known. I myself think of Israel as a criminal entity, a nation built upon the criminal displacement of an unarmed population, and this before any final treaty with the U.N. was signed. The people they were displaced were given no alternative, and just left to survive as they could. it is one more excellent opportunity to bring a bottom-up people’s peace plan, agenda and perspective to the attention of the congress, the administration , media and public. and likely j street as well. or almost of it, 22 organizations and groups were represented, and drafted a letter to the parties outlining the essential questions to be considered. of course it had no influence at that time, but did give a bit of coherence to our movement. it was too local, but a good model. and inviting, and demanding, the leaders, from all the parties, come and listen, and hear from the organizations and activists on the ground what is needed and necessary. the presence of the israeli first minister here, with all his in american collaborators, with a highlight joint session of the congress, is the best opportunity in a long time, to highlight the alternative. not to be missed. many of the comments on the article reflected the despair there was not more organizing going on. maybe a statement of “the alternative” would give people something to organize around, like a next expression after the last Sabeel statement. with more participants. is this possible? are we a we? Thank you Jim for telling it like it is. We can do more than vent – there is action to be taken. There is an exciting initiative coming this spring that will challenge the current blockade of Gaza, the Freedom Flotilla Two. You can find out more at freegaza.org, or witnessgaza.com. Sites contain a tribute to recently killed Vittorio Arrigoni, who arrived in Gaza in one of the first boat’s to Gaza in 2008. This year’s flotilla will include boats from as many as 22 countries, including the US, and from Canada (canadaboatgaza.org). Organizers are looking for organizations and individuals to endorse this flotilla, and to contribute to medical and educational aid that will be delivered. I deeply appreciate both Jim Wall’s careful research and documentation and the suggestions of those who have responded to this blog. What I missed was some insight into the role of Speaker Boehner in issuing this invitation, and the way plenty of his Democratic opponents on other issues have fallen in behind him on this unfortunate decision. An address to a joint session is too important and prestigious a forum for any but great and trusted statespersons. Are there no criteria for such selections? The appearance of a person like Netanyahu diminishes the Congress and will further weaken American leadership. “So likewise, a passionate attachment of one nation for another produces a variety of evils. Sympathy for the favorite nation, facilitating the illusion of an imaginary common interest in cases where no real common interest exists, and infusing into one the enmities of the other, betrays the former into a participation in the quarrels and wars of the latter without adequate inducement or justification. It leads also to concessions to the favorite nation of privileges denied to others which is apt doubly to injure the nation making the concessions; by unnecessarily parting with what ought to have been retained, and by exciting jealousy, ill-will, and a disposition to retaliate, in the parties from whom equal privileges are withheld. There are many groups working all over the country for justice in Palestine and an end to the Israeli Occupation and Apartheid. The US Campaign to End the Israeli Occupation, is having a “moveover AIPAC ” gathering in DC the week of May 21-24 in DC, at the time of the AIPAC conference, when American politicians pay homage to the Israel Lobby. People should take part if they can. I am unable to go those days, or I would be there. Check it out on the web. I hope some of you can go. Maybe Jim’s blog can become a focal pont for recommending actions. Enough is enough of US support for Israel’s horrific treatment of people, simply because they are not Jewish. It is a morally unacceptable. Those who commented seeking further organizations of a like-mind to SABEEL are urged to also familiarize themselves with the websites for “If Americans Knew” and AntiWar.com. I also suggest Jewish Voice for Peace, which I’ve found to be perhaps THE best “inside source” for honest criticism of Israeli policies and influence. In addition, Dr. Mark Braverman (also Jewish, possibly messianic) is an extremely eloquent writer / speaker on behalf of the Palestinian cause. Last, and perhaps most contraversial, is the Institute for Historic Research (IHR). It is my fervant hope that soon all these voices can be brought together in a loud chorus with a common theme countering the Netanyahu visit. We must indeed join forces and SPEAK OUT, demanding justice, and insisting that leaders from all camps pay heed to the organizations and activists speaking out on this important cause. See you at the D.C. events in late May. John Kane asks: “Anyone know of other organized or organizing Christian groups?” Organizing now is Episcopal Peace Fellowship’s Palestine Israel Network [PIN] — check out the website: [http://epfnational.org/PIN]. The network aims at a more vibrant Episcopal Church witness for justice and peace in Israel and Palestine, in response to our baptismal promises, the call of Palestinian Civil Society for boycott, divestment and sanction, and the prayerful call of the Kairos Palestine Document. We have benefited greatly from meetings with the Presbyterians’ (USA) Israel Palestine Mission Network. We are adapting their teaching tool, “Steadfast Hope,” for the Episcopal Church. Contact Cotton Fite, convener, for more info [cottonfite@me.com]. Thanks for an outstnding article. Perhaps, we need to create a new paradigm, altogether: The sad truth is that the Zionist movement has 2 capitals, Washigton, D.C., and Tel-Aviv. I am saying this factually, not emotionally. Palestinians and Arabs should recognize this fact and stop pretending. They need to deligitimize the US as “honest broker”and replace the US with China, or Turkey, or Republic of ireland, or Scandinavia, as moderator or go-between. Meantime, Palestinians should head straight to the UN to declare a state, no matter what promises and honeyd forked tongues try to disuade them. It is time for us Americans to declare an uprising against the State Department outsourcing of our foreign policy to Israel. Perhaps we can have 3 well-known Jewish (Halper? ), Muslim (Ali Abunimah? ), Christian (Desmond Tutu?) speakers address the people across the street from Congress, or the White House, same time as Netanyahu’s speech to make the counter point to Netanyahu. It can be done in a creative manner to attract media. Thanks for the petition information Athey. I just signed it and will send it around. I hope we get tens of thousands. It’s like we are up against a wall that has been built in front of our own government and Congress that has been erected by a powerful (read money) Lobby, that keeps voices for justice and equality outside of the barricade it has created. We have to remove it so that justice can get inside and we can make real changes.